Visitors are permitted at the management's discretion. We DO NOT allow large noisy gatherings or parties in our rooms. Guests must leave the premises quietly before 10:00pm. 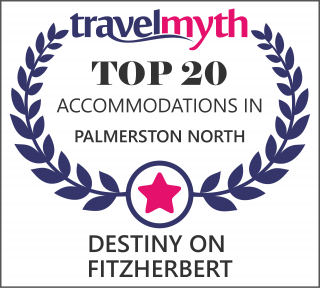 The registered quest is responsible for the behaviour of their visitors when at Destiny on Fitzherbert. All deliberate or reckless acts that result in damage to our property and any costs associated with inappropriate behaviour resulting in loss of income to Destiny on Fitzherbert will be charged to the registered guest. We request that visitor vehicles are parked outside the complex. If you would like a wakeup call, just call us at reception ext 800 during office hours to arrange.